I added new timeslots, but my Pins are not filling them in! 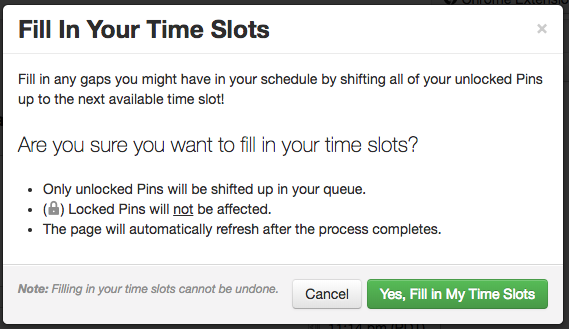 See three ways to quickly fill your empty timeslots with Pins. To fill in the newly added timeslots or fill gaps in your schedule manually you have three options: one-click fill in, drag a currently scheduled post to an empty slot, or schedule new Pins to fill in the new timeslots. 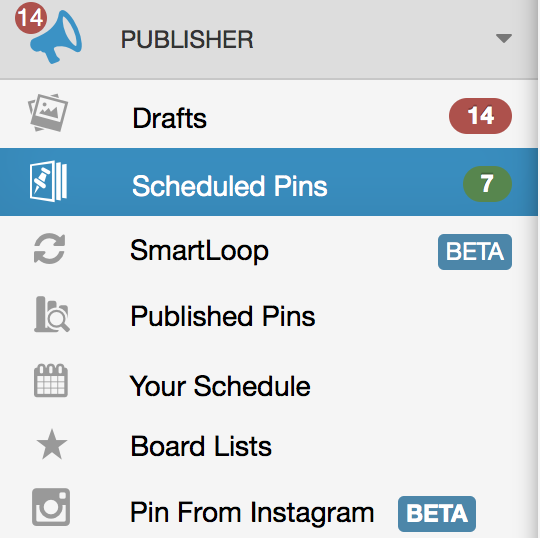 Helpful Tip: Shuffling will only move the Pins around within other scheduled Pins, but not fill in open/new timeslots to make sure that any prior scheduled Pins don't jump out of an expected publish time as you add new timeslots. Fill in empty timeslots with one click. 5. Ta-da! All unlocked Pins have now been "condensed" to fill in the first available empty timeslots. Drag and Drop Scheduled Pins. If you only need to move a couple of scheduled Pins into the empty timeslots, try to drag and drop a scheduled Pins instead! Schedule new Pins to fill in the new timeslots with the help of our Knowledge Base Article: How to Schedule Pins.